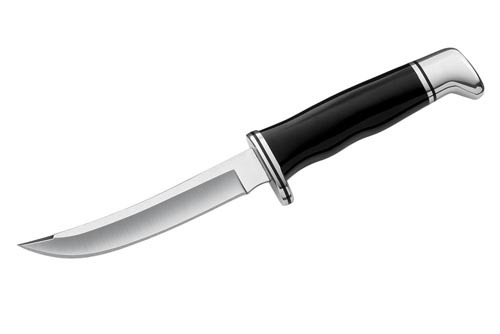 Personal Knife Black Phenolic: The popular 118 has been a long time favorite among collector's and remains an exceptional choice for a hunting knife or simply as a collectible. Either way, it is a classic, and a personal favorite of many. Made in the USA Blade Shape: Skinner Blade Length: 4 1/2" (11.4 cm) Weight: 5.5 oz (156 g) Handle: WOOD Carry System: Sheath Origin: Made in the USA Blade: Satin Finish, 420HC Stainless Steel Handle: Phenolic, Black Carry System: Genuine Leather Sheath, Black Available Features and Options 420HC Steel This is Buck's standard blade material because it approaches the wear resistance of high carbon alloys while delivering the corrosion resistance of chromium stainless steels. Add our exclusive heat-treat process and you have a very user-friendly combination of superior corrosion resistance with excellent strength for wear resistance and durability. You also have a blade that is easy to resharpen. For best performance we harden to a Rockwell hardness of Rc 58. SKINNER Best suited for skinning game. The tip is narrow, while the wide curved belly gives a nice skinning sweep that aids in get­ting through thick layers. The downward angled, more blunt point makes it harder to make an accidental slice through the hide.